Frogger’s coin-op thrills are back and better than ever in Frogger: Hyper Arcade Edition! 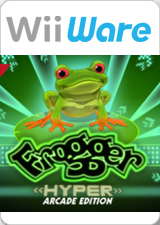 Jump into the action with classic and brand-new game modes like Tile Capture, Battle Royale, Freak Out and more that expand the challenge of Frogger's style of run-and-dodge gameplay. Customize your game experience through a variety of different skins, from the modern neon style of HYPER ARCADE to the 8-bit sprites from Frogger, Castlevania and even CONTRA! Throw down against friends or the CPU in up to 4 player matches to find out who's really the top frog! The graph below charts the compatibility with Frogger: Hyper Arcade Edition since Dolphin's 2.0 release, listing revisions only where a compatibility change occurred. This page was last edited on 15 January 2018, at 02:18.